So much new to talk about. IFA 2018 tech show is currently underway in Berlin. The American equivalent would be the Consumer Electronics Show, so you can imagine a lot of companies use this as a chance to introduce brand new tech lineups. Harman, Samsung’s audio subsidiary, is taking the opportunity to announce several different types of audio products this week. The first announcement is the Harman Kardon Citation speaker series. This will be a modular home audio setup where you can buy the speakers individually or buy them together and create a surround sound system, which is similar to what Sonos does with its speakers. The entire system will cover four tabletop speakers, one sound bar, a subwoofer, and floorstanding towers. They will also have Google Assistant built in, which is a trend we’ve seen a lot from IFA speaker announcements this week. The Harman Kardon Enchant series is getting two new versions, the Enchant 800 and Enchant 1300. 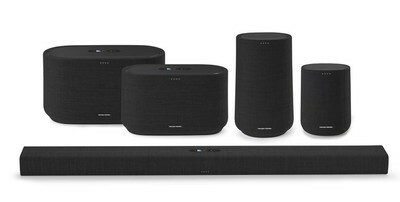 These sound bars use Harman Kardon’s proprietary MultiBeam technology, which helps them simulate surround sound without a full surround sound setup. They will also have Chromecast built-in for easy access to your favorite apps. While not available for sale just yet, B&H does have the 800, the 1300, and the new subwoofer available for pre-order. Harman is also announcing a follow-up to the JBL Charge 3 portable Bluetooth speaker called, unsurprisingly, the Charge 4. It will have 10 different color options, 20 hours of play time on a single charge, and the ability to connect to up to 100 other JBL Connect+ devices at the same time for real ragers. Like previous Charge speakers, you’ll be able to plug in and charge your mobile devices using the built-in battery. Other JBL gear includes the true wireless earphones the JBL Endurance PEAK. These earbuds are designed for working out with water-resistance, tech called TwistLock and FlexSoft designed to ensure they never fall out, and PowerHook, which will turn them off automatically when you take them out of your ears. With a four-hour battery in the headphones and 24 more hours in the carrying case, you’ll go a long time without ever needing to plug in. JBL’s Link Bar is a new sound bar with Android TV, Chromecast, and Google Assistant. Not only will it enhance your speakers with JBL’s sound, but you’ll also be able to access all your favorite Google Play apps, stream content, and control it all with your voice. It will come out in October for $400, although B&H does have a pre-order page up. The JBL Link View is very similar but seems more like a competitor for the Amazon Echo Show. It includes an eight-inch touchscreen, 5MP front-facing camera, and all the Google stuff built right in. You can order it for $250 on JBL’s site because it looks like it’s coming out very early in September. Under Armour is teaming up with JBL to release a lineup of wireless Bluetooth headphones for gym goers called the UA Sport Wireless React and Wireless Pivot, which are building on the success of Under Armour’s previous headphone models. Similar in design to other headphones we’ve seen, like the Anker SoundBuds Curve, these will be lightweight, aluminum headphones with rugged cables, water-resistance, unique ear tips so everyone can wear them comfortably, and up to nine hours of battery life. These will also come with a free one-year membership to Under Armour’s MapMyRun, which allows you to track and analyze your runs over time and normally costs $30. 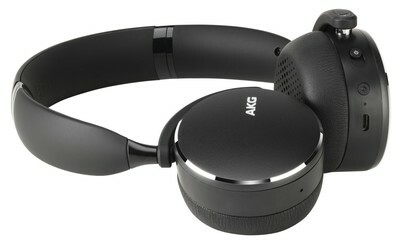 AKG has four new wireless headphones coming out. The N700NC over-ear headphones will be the flagship pair with adaptive noise-cancelling, tech for taking calls on the go, a 23-hour battery life, and more. The N200, Y500, and Y100 headphones will also feature exceptional sound with Bluetooth Apt-x technology, magnetic ear buds that snap together for easy management, and auto-play features that can detect when you’re wearing the headphones or not.